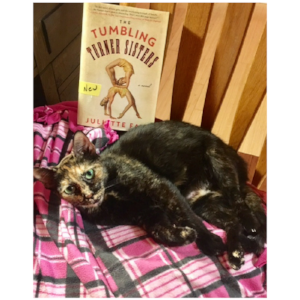 The Tumbling Turner Sisters by Juliette Fay caught my eye during a wander through the "New Arrivals" bookcase at my local library. I'm glad it did! Set in 1919 - 1920, this book tells the story of four sisters whose lives change forever after their father injures his hand and is unable to work. Even before the injury, their mother Ethel pushed the three girls still living at home to come up with a sister act. They resisted, but finally humored her after watching an acrobat group perform at a vaudeville show. The act never went beyond a few practices in the backyard. When times get tough, Ethel demands that the girls work on "the act" again. The act gets a boost when their oldest sister is widowed and returns to the family home with her infant son. The book alternates chapters between the viewpoints of the two middle sisters, Winnie and Gert. Winnie dreams of attending college someday - not common in a time when women can't even vote. Gert has no use for school, but knows she does not want to follow in her mother's footsteps. Political issues and real events of the time are woven nicely into the backdrop of this story. Each chapter begins with a quote from a vaudeville performer, usually someone you will recognize from other types of performance. There are expletives and uncomfortable situations in the book. I would've still enjoyed it back in my YA days, but it is not classified as such. Why should a clogger read this book? I think this is a good book for performers of all types to read. The sisters learn a great deal by befriending other performers and their act improves accordingly as the book goes on. A comedian teaches them how to deal with hecklers, a tap dancer builds them a springboard, Winnie tends to an injured acrobat, older sister Nell fills in when another performer suddenly quits. Gert discovers that sometimes working with your biggest rival benefits you both. All of the sisters learn to stand up for themselves and that not everyone should be trusted. And of course, even when things go wrong, the show must go on! In chapter twelve, the Turners are booked at a small venue. A group of "painfully off-tempo" cloggers are part of the lineup. They receive only the briefest of mentions, but how often do you find random cloggers in your reading material? The author booked the Tumbling Turners at vaudeville houses that still exist today even though they may be used for different purposes. A listing in the back gives current names of the buildings. The author's great-grandfather was a vaudevillian, and she named a character after him. The great-grandfather used to give clogging lessons at his home, too! Cary Grant got his start in vaudeville! He appears as a character in this book under his real name of Archie Leach when his acrobat troupe performs in the same show as the Tumbling Turners. Do YOU have a clogging book to recommend for a future book review? Newer PostHappy Double Double Day! It's time for cloggers to have a holiday! Older PostNational Popcorn Day, clogger style!